by Bob McDowell, Contributing Author: It has long been my ‘professional’ opinion that the strong push by extremists in their cause of misguided ‘environmentalism’ has a more sinister motive behind their insatiable lust to change our way of life. That motive being a world-wide organization committed to the drastic reduction of the human race. I will omit my personal experience with one or more individuals professing allegiance to that movement. In several recent decades, the push to convert our energy system to "renewable energy" has also led to increased numbers of elected officials and government employees who push laws and rules to finance unprofitable energy ventures by underwriting them with grants, tax benefits, and other financial advantages. This movement was given a massive green light (pun intended) by the Obama Administration for the last seven years and the previous two year when the Congress was solidly control by the Democrats. President Bush, 43, chose not to exercise his veto authority, possibly because of a likely override vote. 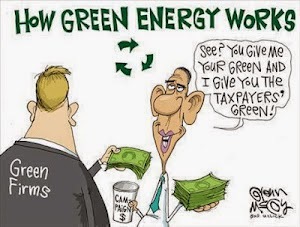 As a result, we have witnessed numerous examples of gross misuse and the waste of massive amounts of our taxes and borrowed money in support of "alternative energy" sources. Finally, it seems, there are some attempts at reversing this massive boondoggle by members of Congress who were elected by an awakened electorate demanding more common sense representation of their interests. A recent example is the junior Senator from Oklahoma, James Lankford offering an amendment to the "energy bill" to end the massive tax credits to the ‘wind energy’ operators and developers. Also, Republican presidential candidate Ted Cruz, R-TX, had the courage in Iowa to propose a phasing out of the subsidies for ethanol which is added to gasoline. His action resulted in a rebuttal by the Governor of Iowa, a republican, who told Iowans to vote “‘anyone but Cruz.” However, from the caucus results, it appears that the Iowa Republicans have more common sense than their governor! The subsidies (our tax dollars) supporting the blending of ethanol into gasoline has been detrimental for several reasons. Ethanol is detrimental to engines older than 2005 engines and results in reduced fuel mileage. This is even worse in the summer months because the boiling point of any alcohol is much lower than water. The heat from the engine and roads will cause ethanol it to boil away especially in town driving where it is often in the tank much longer. Further, using corn for ethanol drives up the price of food! Also, waste is increased. The artificial profiting from ethanol subsidies and tax credits tends to make some operators less efficient and potentially crooked in their operations. As for wind energy, I believe that the massive windmills, called turbines, are most wasteful of space, kill birds, and tend to have a short operation life. As for individuals who install roof mounted solar panels, the state legislatures are pressured by utilities to levy ownership taxes on these home owners who invested much to install them. In at least one state, it is required that the utility ‘buy back’ excess solar electricity at RETAIL price rather than a more sensible wholesale price thus making matters worse. As for the former government ‘depletion allowance’ allowed to oil and gas is another matter best addressed in another article. as for the above, t is past time for cuts in "big government" spending on faux renewable energy efforts. Robert "Bob" McDowell, Jr. is a retired Professional Engineer and Geologist with over 50 years experience in creating drilling prospects, supervising drilling, well completion, production operation, and pipeline design for oil and gas including repair of problem wells. McDowell is a conservative activist and member of the Oklahoma Republican Assembly. He Contributes opinion and commentary articles to the ARRA News Service. Tags: Bob McDowell, spending cuts, faux renewable energy, To share or post to your site, click on "Post Link". Please mention / link to the ARRA News Service. and "Like" Facebook Page - Thanks!